E-bikes are widely available in all price ranges. But some models stand out. One of them is the Unimoke from Urban Drivestyle. The pedelec looks a bit like a moped, lasts a lot and is a lot of fun - and that's also because of the dedicated community of fans centered around this e-bike, welcoming you in to a friendly subculture of enthusiasts. Anyone who rolls through the streets on the Unimoke will get a lot of curious looks. Is that a motorcycle? No, the lamp's just big enough to help you see better. What's with the fat tires? This means you don't slip into any tram rail and you can even negotiate country tracks and sand without any problems. And this long bench? Yes, the sitting position is unusual, but it's also great for passengers. The sturdy frame? The Unimoke is supposed to withstand a lot, it can easily carry 150 kilograms of payload, and unofficially considerably more. Even if the makers of Urban Drivestyle under ounder Ossian Vogel can justify every design feature with practical aspects, the company also considers style. The look, which is strongly reminiscent of mini motorcycles such as Honda Dax or Honda Monkey, famous from the 1960s, is quite intentional. The long bench seat offers plenty of room for two adults, in the test even three children fit between the adult driver and the handlebars. Footrests can be mounted at the front and rear so that the feet of the passengers have a safe place on the Unimoke. And then we're ready to go: turn the key around in the battery, switch on the on-board computer, set the engine support to one of nine levels, and drive off. A classic seven-speed gear shift ensures that you can start off comfortably in any position - after not even half a crank turn, the engine starts anyway, which easily manages every mountain. Everyone who has tried our Unimoke in the past days - and there were quite a few of them - got off the bike with a grin on their face. Children didn't want to get off, adults wanted to go for a ride. I really is just incredibly fun. The fascination of the Unimoke is huge at least in the beginning, let's see how long it lasts in the hard everyday life of a cyclist. I tried the the 250-watt version of the Unimoke, because this is the only version approved in my home of Germany as a pedelec for road traffic, but for the international market Urban Drivestyle also offers more powerful motors with 750 watts including the appropriate batteries. Even with this small motor, my Moke made a good impression, accelerating effectively and and bringing the e-bike from the traffic light to the other side of the intersection to roughly 20 km/h (12 mph) and more. At 25 km/h (15 mph) the engine support ends. With a bit of pedaling in seventh gear, you can easily reach over 30 km/h on a flat track, the rolling resistance is not excessively high despite the thick tires. Once the battery is empty or the driver wants to get some exercise, the weight of around 30 kilos can be quite tedious when going uphill. With one load, the Unimoke manages between 40 and 60 kilometers (25-37 miles), depending on the driver's weight, distance and engine level. Charging is either done directly at the wheel or the battery is removed. In addition to its visual appearance and flair, the most outstanding feature of the Unimoke is its very large and committed community, which exchanges information on Facebook, among other things. Photos and tips are exchanged, customization and mods are shown, driver meetings are organised and much more. Urban Drivestyle actively supports this community with advice and action, supplies spare parts without red tape and organizes events itself. The Unimoke with a 250 watt motor costs $3,253.04, and one with a 500 or 700 watt motor costs $3,365.60. That sounds like a lot, but it's absolutely in the range for a good pedelec. Urban Drivestyle also offers a lot of accessories from seat extensions to trailers and bags to short and long mudguards to customize the Unimoke. 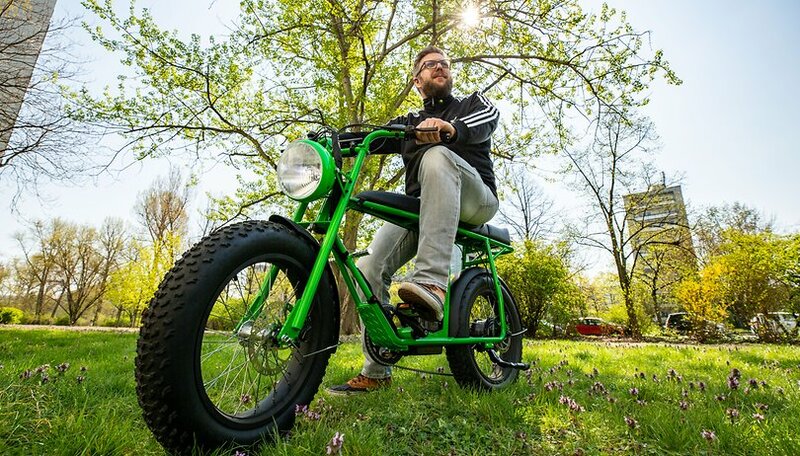 Urban Drivestyle has lent us a Unimoke for this cycling season. We will investigate for you, how it manages to prove itself in everyday use and also in the long term. If you have any questions, please feel free to write them in the comments!